Floating vanities. Virtually every luxe hotel room sports a floating vanity. And there is good reason. They instantly signal a modern sensibility. 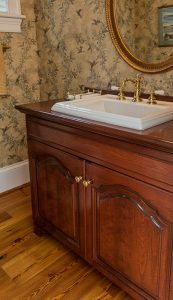 Typically, these vanities have clean, angular lines, but there is nothing to say that you couldn’t choose a more traditional style if that suits your taste and complements the rest of your decor. One of the nicest contributions made by this style of vanity is the appearance of more openness and spaciousness. But that can be quickly lost if homeowners begin to stuff baskets filled with towels, pairs of slippers, a bathroom scale and the like underneath. Resist the temptation and keep it clean. Matte black. For many years now, chrome and brushed nickel fixtures have been favored. But, in very recent years, homeowners have begun choosing brass and oiled bronze for a more “heritage” appeal. The newest trend – there’s that word – that seems to have some staying power is matte black. I once heard a designer say that every room needs a touch of black to anchor the design. Finally, that seems to have caught on in the bathroom for a simultaneously vintage and modern look. How can that be? Designers manage it all the time. Not only is matte black a striking choice for fixtures, but for shower walls. If you’ve ever watched the wildly popular HGTV program “Fixer Upper,” you have seen how Chip and Joanna Gaines popularized windows with matte black metal mullions, usually with large panes of glass between. That look is now available for shower walls, and it is stunning. 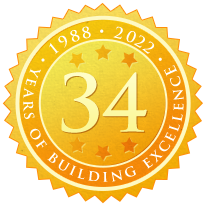 You will sometimes hear these referred to as “Crittall,” which is a well-known English steel-framed window manufacturer that has been around since 1989. Open shelving. Fairly recently, open shelving became popular in kitchens, usually used in place of upper cabinets. Even more recently, the look has migrated to the bathroom, with open metal shelving being the most up-to-the moment. Open shelving definitely keeps homeowners honest in the clutter department because it only works if what is visible is beautiful, minimal and neatly arranged. If you long for looks you see in magazines, I guarantee that much of what attracts you is the clean, uncluttered, “staged” space. Most of us hang on to way too many lotions and potions, small appliances and paraphernalia that we really don’t need or use. I urge you to purge. You will have so many more design options if you aren’t trying to accommodate a bunch of stuff of dubious import. Graphic floor tile. Bathrooms tend to be monochromatic to keep the vibe calming and the feeling open. 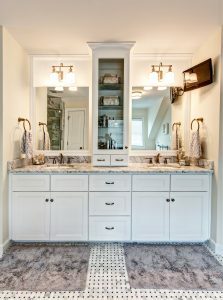 If you’ve watched another popular HGTV program, “Flip or Flop,” you'll see that Tarek and Christina have popularized a monochromatic bathroom – often in tones of white, gray, and black – but with a pop of bold graphic pattern on the floor. By choosing tile in that same neutral palette, the bathroom still has a cohesive, relaxing feel, but with a little more sizzle. This monochromatic graphic approach is also suitable for an accent wall, including, say, the back wall of a glass shower. Wood. With all of their stone, tile, porcelain, metal and mirrored surfaces, bathrooms can possess a look that is both cold and hard. By injecting some wood – or even wood-look ceramic – into the space, you will soften the appearance with an organic richness. Wood tones are beautifully complementary to today’s preference for white and gray bathroom palettes because the warmth of the wood plays off the cool undertones of the gray. Depending on how the wood is used – especially if you combine it with metal, and perhaps expose well-crafted plumbing – you can achieve a kind of vintage industrial look that harkens back to the days when factory floors were made of wood. Accessories. Just as open shelving has migrated from the kitchen to the bath, accessories have done the same. In particular, art – both sculptural and two-dimensional – and long, luxe drapes have taken up residence in the bathroom. Bathrooms and their appointments tend to be all function-related. Artwork creates a focal point that isn’t, while drapes tend to soften all of the slick, hard surfaces that characterize bathrooms. If you choose 2-D art, be sure it is properly framed and your bathroom well-ventilated to prevent moisture damage. I hope my mini-roundup of some recent-ish design approaches has inspired you to create a next-level bath on par with the best room in your house. 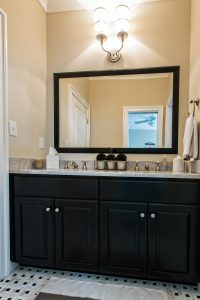 If you have a question about building, remodeling, or designing a bathroom that might well be the best room in your house, I hope you will email me at chris@vbhomesliving.com.